A combination of education and hard-earned life experiences make Colonists far more capable individuals than they appear. When the time is right, they can put their experience to good use. 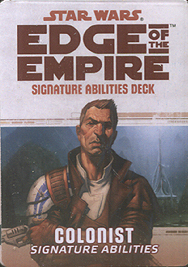 This deck requires the Edge of the Empire Core Rulebook and Far Horizons. It includes 18 cards covering both Colonist Signature Abilities and their upgrades.